Espionage is the use of spies, or the practice of spying, for the purpose of obtaining information about the plans, activities, capabilities, or resources of a competitor or enemy. It is closely related to intelligence, but is often distinguished from it by virtue of the clandestine, aggressive, and dangerous nature of the espionage trade. The term espionage comes from a French word meaning to spy. The Middle French espionner appears to be related to the Old Italian spione, which in turn is linguistically akin to the Old High German spehon. This is interesting philologically, since French, Italian, and German have very different historic roots: the first two derived from the Latin of the Roman Empire, while the third comes from the language of the Romans' "barbarian" foes across the Rhine. It is perhaps fitting that the very etymology of espionage would reflect surreptitious connections. A brief history. Though the word itself entered the English language from the French in 1793, at a time when the foundations of modern espionage were being laid, the concept of espionage is as old as civilization. Ancient and classical era scripts often mention spies and the use of espionage (e.g., the Bible mentions spies some 100 times) while the Greek legend of the Trojan horse suggests that covert operations and "dirty tricks" are nothing new. The roots of espionage in the East are likewise very deep: in the third century B.C. , both the Mauryan empire of India and the China's Ch'in dynasty ensured control over their vast realms with the help of spy networks. Despite this early evidence of organized spying in east Asia, espionage tended to be an ad hoc enterprise until the late eighteenth century. The reign of terror that followed the French Revolution—significantly, in 1793— marked the beginnings of the modern totalitarian police state, while the American Revolution a few years earlier saw the beginnings of a consistent interface between military operations and intelligence. Military intelligence came into its own during the American Civil War, while the late nineteenth century saw the birth of the first U.S. military intelligence organizations. 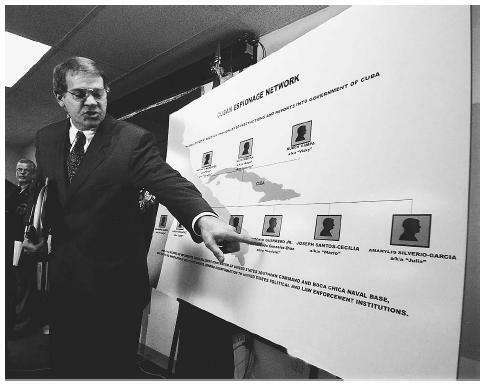 United States attorney general for the southern district of Florida Thomas Scott shows a diagram illustrating a Cuban espionage network operating illegally in the U.S. as foreign agents of the Cuban government in 1998.
have been the most visible, and romantic, spy of the war, there were many others on both sides. The war also gave birth to the first true totalitarian state, in Russia, and this was followed soon afterward by the establishment of fascism in Italy. Totalitarianism spawned its own elaborate spy networks, and increased the requirements for espionage activities on the part of democracies, as evidenced by the U.S. experience with Nazi and later Soviet infiltrators on American shores. The era that perhaps most commonly comes to mind at the mention of the word espionage is the Cold War, which lasted from the end of World War II to the fall of the Berlin Wall and the Soviet empire. Yet the end of Soviet communism was certainly not the end of espionage, a fact that became dramatically apparent as new U.S. enemies emerged among Islamist terrorists and their supporters. In any case, espionage is not solely the enterprise of governments: companies have long sought to gain the advantage over competitors through the use of economic or industrial espionage. In a world increasingly dominated by huge corporations, economic espionage is not likely to disappear. Nor is espionage only undertaken against enemies: the United States has captured, and punished, spies who passed U.S. secrets to such allies as Israel and South Korea. Dulles, Allen Welsh. The Craft of Intelligence. New York: Harper & Row, 1963. Haynes, John Earl. Venona: Decoding Soviet Espionage in America. New Haven, CT: Yale University Press, 1999. Martin, David C. Wilderness of Mirrors. New York: Harper & Row, 1980. Wright, Peter. Spycatcher: The Candid Autobiography of a Senior Intelligence Officer. New York: Viking, 1987.